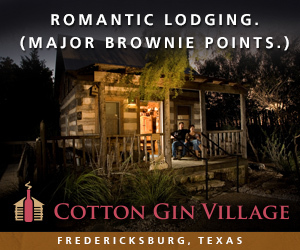 When visiting Texas wineries, one of the most fun things to do is actually stay overnight at a winery. A lot of times the winery may have live music at night which lets you enjoy the music with a bottle of wine and not have to worry about driving home or to the local hotel. How nice it is to just walk to the winery’s lodging to stay the night. We have stayed overnight at a couple winery’s and have enjoyed every minute. 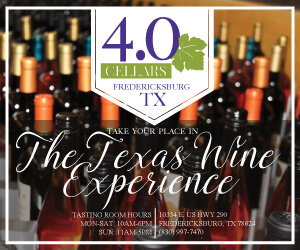 In our last trip to Fredericksburg we were considering staying at a winery, but the ones we were aware of were already booked. 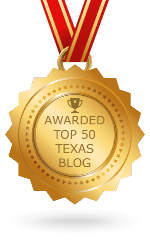 Hence the birth of this post which is what Texas wineries actually have lodging. 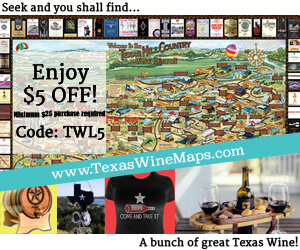 Doing a little research of websites and knowledge from visiting wineries, we found the Texas wineries which have lodging. If we have missed one, please let us know and we will gladly add it to the list so everyone will know it is available. 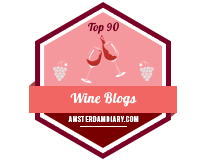 The following are listed in alphabetical order within each region we have on the website of hopefully all the wineries in Texas. Becker Vineyards has a log homestead cabin circa 1890 which is the original homestead. Its renovation was completed in 1997 and for years served as a charming Bed and Breakfast. It is no longer in operation as a B&B but is reserved for special guests of the winery and used in conjunction with wedding parties and special celebrations. Barons Creek Vineyards in Fredericksburg is open and has very luxurious accommodations for staying at the winery. There are two villas available with a total of 12 suites which can be reserved. Even though Compass Rose Cellars has closed, there are three casitas (little houses) that are cottages down the hill from the main tasting room in Hye. Each casita has a kitchen, bedroom area, TV, wi-fi, and more. We enjoyed a weekend stay in one of the casitas when they were first available. The winery has changed to wine club only for tasting, but the casitas are being managed by Hye Market. Please see the website for reservations. Fall Creek Vineyards at Driftwood has an on-site guesthouse available that sleeps four people in two bedrooms. Full kitchen, living room, fireplace, and cable TV are provided just steps from the winery. Flat Creek Estate does not advertise they have a bed and breakfast on the website because it is one room and is booked a lot for weddings. It can be reserved for up to 6 people. There is a full kitchen and patio with grill. They also book their Vintner’s Quarters often on the nights of their special dinners which is done on the first Saturday of every month plus a few additional “theme dinners” throughout the year. The Mendelbaum Winery guest cabins are located on the beautiful bank of Grape Creek, just 9 miles from historic downtown Fredericksburg. These guest houses are perfect for a peaceful getaway for couples, family, friends or even corporate retreats. Just steps from your cabin enjoy the Grape Creek Trail, tour the historic Lower South Grape School, pick your own peaches in the orchard (seasonal) and enjoy a bonfire under the Texas Hill Country stars. Discounts are given in the Mendelbaum Winery for guests staying in the cabins. 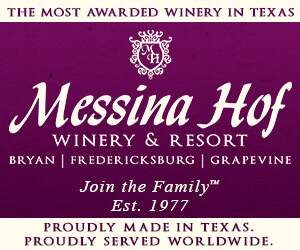 Messina Hof’s new location in Fredericksburg includes four separate buildings for staying overnight. Staying there also includes a basket which includes breakfast breads, fruit, juice, and a bottle of Messina Hof sparkling wine. Most wineries have their lodging next to the winery. However, since lodging first came for Rancho Loma Vineyards, it is located 11 miles from the tasting room in Coleman. It is recommended to book reservations two to three months in advance on their website for one of the five rooms, and a dinner reservation should be reserved too. The Vineyard at Florence has luxury rental villas available for a night or weekend. The vineyard or hill country views are magnificent from their villas and inns. Breakfast is included at some of the villas. If you stay on a Saturday night, the Vineyard at Florence has a very nice Sunday brunch. Nestled on a hillside in Lago Vista, overlooking Cottonwood Hollow on Lake Travis, are two Tuscan-style waterfront condos surrounded by a family-owned vineyard. This Swiss log cabin resort is on 26 acres along a creek. 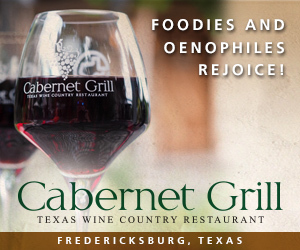 The vineyard is the one and only within the City of charming Fredericksburg. Farmhouse Vineyards in the Texas High Plains has a cottage on Airbnb in Johnson City available for rental. The Airbnb reservation also includes a tasting for two at the Farmhouse Vineyards Tasting Trailer. We wrote more information after staying at the Cottage. A four bedroom guesthouse is available within walking distance to Blue Ostrich Winery. There is a great view available from the long front porch and a pool and spa are located on the property. We had the chance to stay at the guesthouse and had a wonderful time. The log home next to the winery has now turned into a restaurant. Cabins are being built though for overnight stays. Six unique villas are available at Fortunata Winery which is north of Dallas. From romantic rustic Italian, to hip modern elegance, you are sure to find a villa that you will enjoy. While there, enjoy the authentic Italian cuisine including a brick oven pizza. Kiepersol has a number of lodging options starting with the Bed & Breakfast with five luxurious rooms. Three rooms have private porches and hot tubs. The Bed & Breakfast is adjacent to the restaurant which is open for dinner and provides fine dining, and also includes your choice of a breakfast. Also available is the Stable House, Vines Chalet, and Caretaker’s Cottage. A cottage is available at Los Pinos Ranch Vineyards for you to enjoy. Los Pinos has live jazz music on Saturday nights with dinner available, so a Saturday night stay is perfect for enjoying the music and retiring to a cottage in walking distance. 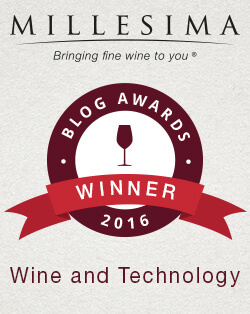 Mitas Hill Vineyard has a gorgeous location and facility and have opened their Lodge at Mitas Hill. It features four bedrooms and is available to wedding parties and all rooms are available for guests during special events at Mitas Hill. 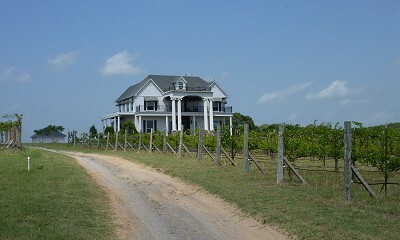 The Sanger location of Sugar Ridge Winery has a bed and breakfast in the small town. Check their website to contact them for availability. The Inn at Tara is a mini-mansion located among Tara Vineyard & Winery’s vineyards. A complementary winery tour and tasting is given to guests and dining is available at the Cellar Door which is located at the winery. Also available is a cottage for up to six guests. Umbra winery at La Buena Vida Vineyards remodeled and expanded the existing La Buena Vida Vineyards at Springtown. Cottages are available for rental. The loft at Bernhardt Winery is located above the winery and overlooks the countryside. Enjoy the quiet of the country in their Tuscan style guest room. A bottle of wine is included along with wine and hors d’oeuvres at sunset and a continental breakfast in the morning. 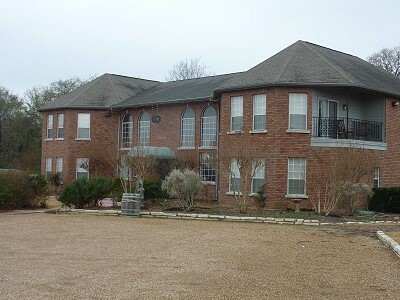 Clear Creek Winery has a luxury bed and breakfast called the Clipper House Inn. The property has seven antique filled cottages located steps away from the winery. The Villa at Messina Hof Winery & Resort hosts 11 beautifully appointed rooms richly decorated with timeless antiques and furnishings from different romantic eras. Included with your stay is a winery tour and tasting, evening wine and cheese reception, and a European-style champagne breakfast. Unfortunately, we could not find any wineries located in the Western region which include overnight lodging. However, there is a famous vineyard which does. The bed and breakfast near Plains, Texas and the Newsom Vineyards is a four bedroom house which can be rented in its entirety or by the room. The bed and breakfast gives one a very quiet evening and most of all the fantastic hospitality of Neal and Janice Newsom.